Link and Zelda embark on an adventuresome quest in the Land of Calatia to rescue Hyrule's King and Calatia's Queen from the dastardly fire warrior Militron! This quest features a character-switching system, and many, many scripted items, some based on later Zelda games, and some reimagined or new. The primary emphasis is on exploration and item puzzles! In terms of combat, the challenge level is meant to be medium/low, with a gradual increase, but there are adjustable settings (and optional items) to make the game easier or harder, however you prefer. There's also a bunch of guides including in the support pack if you get stuck on some of the harder puzzles, or if you can't find some of the secrets- it's all up to you how you want to play! 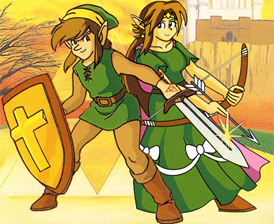 I tried to sort of combine everything I loved about Zelda II, A Link to the Past, and certain elements from Link's Awakening- the kind of stuff I always wanted to see in ZC that it wasn't able to do before scripting. This is a quest where you can release a Bee (from LTTP) to fight a Moby (from Zelda II), for example. Things like Bow-wow (LA), the Switch Hook (OoA), a note-by-note Flute (based on OoT), the Spinner (TP), a Parachute Leaf (WW), and even the Beetle (SS) are all in this quest- and many more. I also completely redesigned the Ladder, which is a manually-used button item now. For variety of items, I think the most inspiring Zelda games were actually the Oracles games, since they had excellent puzzles. For puzzles, I took a little bit of inspiration from The Lost Vikings, though my style is fairly different. In terms of having lots and lots of inventory options, I also took some inspiration from Castlevania: Symphony of the Night, and my partner system is more than a little inspired by Portrait of Ruin, too. I wanted to keep the story simplistic and brief (much more succinct than this post). There are very few cases of multiple-line dialogue anywhere in the quest, and most cut scenes focus more on actions than words. 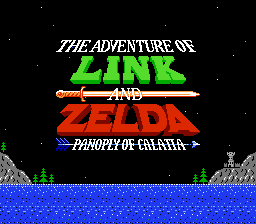 However, there is also a scrolling intro, and the game is meant to be a simple little sequel a while after the events of Zelda II. The full introduction story is inside the Instruction Manual Booklet (in the Support Pack). My other goal was to give the player more options, ways to go to, more different types of abilities to use, and generally have more complex puzzles than standard Zelda fare. There aren't a lot of standard block puzzles, nor true enemy gauntlets; instead, you've got to climb all around with different tools, moving objects, holding pressure switches, switching places, and all that kind of stuff. However, there's also a lot of optional sidequest content, with several minigames, a trading sequence, and secret seashells. In short, it's a complicated quest that's more about experimenting with a million items and the character switch mechanics than anything else, but it also has a lot of thematic tie-ins to Zelda II. Most secrets have some kind of hint- keep an eye out for little oddities. There may also be other contextual hints. Although the game is nonlinear, most of it is set up such that you usually have something you need before you get to a place where you'd need it for anything weird. Don't forget about your old items- they often come back around to be useful again, or even required again, by the end of the quest! Edited by Mitsukara, 25 September 2018 - 10:25 PM. Got perma-stuck in that Spikes of Doom mini-quest. Beaten it on my 1st try and got default ZC-styled ending sequence. After reloading save file, I got auto-warped to that mini-game and perma-stuck here. Had to delete save and restart from scratch. But in all seriousness, I hadn't expected that to be the first thing someone would do. I suppose I could go back and add a means of escape for a future version? Edited by Mitsukara, 25 December 2016 - 11:33 AM. Yokoi dungeon... blue peahats... how do I end them? I have tried bombs, candle flames, charged shots. Try an item you got in the dungeon. Don't touch the controls when the game auto-moves!!! Right at the start, I pressed "up" to see if I can go into the secret forest-part... and it broke the game. ^^"
Reverse darknuts are shielded on all 4 sides. Is that intentional? Also got stuck in that water temple (forgot the name). Missing the compass. You mean the Tunkrads? They shouldn't be shielded at the front, and should be weak to arrows. Also, try looking in the room where you need to use the boss key. Is it me, or secret seashell at screen #88 appears to be missing. Used switch hook on diamond and nothing found. Anyone can confirm whether the secret is working or not? Also, L2 superball shooter uses the same Cset as his lower counterpart. Edited by Alucard648, 26 December 2016 - 04:25 PM. Can confirm that secret appears to not be working. Odd, because I still managed to get all seashells in my last playthrough. i can not find the compas in the yamauchi palace nor get a treasure chest on top of a chain looking flook in the over head view. any tips? Edited by centraltree, 26 December 2016 - 06:57 PM. Confirmed, the seashell secret on screen 088 is non-working. Apparently I forgot to change the Combo it checks for when I changed how switch diamonds handle the Under Combo... but the last time I changed that part was before Dimentio's last playthrough where he got 60. So that suggests there's a seashell that I missed documenting in the location list, too, I think... Sorry! : ( If I release an update it will definitely include that fix, but I'm going to hold off a little longer and see if there's more problems, first. Not sure what you mean about the Superball Shooter using the same CSet, though? It appears the L-2 one fires dark blue and the L-1 one fires dark-green, on my end, which is as intended. you use the ladder on the notch in the wall. I seriously didn't think people would go straight for the Spikes of Doom easter egg area. Maybe I should've made it harder to find? But yes, you can make them walk off the path. The intro areas are walled in (can't warp off the sides), and if you go back to the North Palace they'll start the path over again. Oops! Thanks for catching that, should be fixed now. ... because I forgot to turn off a debug feature I was using. If/when I release a patch, it will address those issues also. Edited by Mitsukara, 26 December 2016 - 07:46 PM. Edited by Zolias, 27 December 2016 - 02:27 AM.